The Federal Reserve (aka "the Fed") is the US central bank that sets policies relating to the flow of money. Even though they'll be the first to admit they don't have perfect control of the situation, their goals are to keep employment high, prices stable, and financial instability at bay. Because these goals are often at odds and because the Fed's decisions have a big impact on financial markets, Fed policy changes are always closely watched. Updates from the Fed are so closely watched, in fact, that markets are accustomed to digging through the Fed's 3-week old meeting minutes for any clues about potential policy shifts. This week's meeting minutes offered a few important clues and better framed the somewhat surprising Fed announcement at the end of January. What was so surprising about the late-January Fed Announcement? Here's the newsletter that covered it in more detail. The short version is that they were much more downbeat in their assessment of the economy, they dropped their recommendation for further gradual rate hikes, and they even hinted at an updated bond buying policy in the near future. Taken together, this was such an abrupt shift that it left traders scratching their heads. It also left traders with much more clarity about how to trade. A downbeat Fed that is talking about holding rates steady and hinting at buying bonds?! That's a clear "BUY" signal for both stocks and bonds. To be clear, the Fed isn't talking about buying bonds in the same way they were during their widely-criticized but arguably successful quantitative easing (QE) programs. QE purchases grew the Fed's balance sheet, and they're currently in the process of shrinking it (by letting their bond holdings mature without reinvesting the principal). This time around, the Fed is talking about stopping the shrinkage! Whenever they do that, it will mean all of the money they earn on their bond holdings can now be used to buy new bonds (bond buying = lower rates). The Fed's normal method of money market influence is to hike or cut its policy rate. While this has a profound effect on short-term interest rates (and a noticeable psychological effect on the stock market), its not nearly as effective as the balance sheet (aka "bond buying") when it comes to longer-term rates. The relative impact of rate policy and bond buying policy can be seen at 2 key points in the past 2 months. 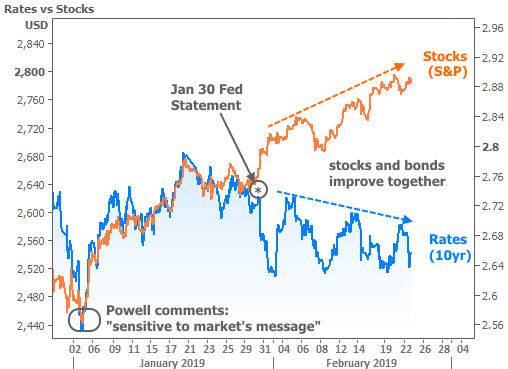 At the beginning of the year, Fed Chair Powell said the Fed is "sensitive to the message markets are sending." In other words, they recognized that they'd eventually need to do something if the stock market continued to plummet. At the time, Powell was happy to reaffirm that the Fed's bond portfolio would continue to shrink at regular intervals (i.e. no increase in bond buying on the horizon). The stock market was happy about the Fed implying slower rate hikes, but that wasn't big news for longer-term bonds (like 10yr Treasury yields and mortgage-backed bonds). Thus stocks and rates moved higher together in January. The January 30th Fed Announcement introduced the possibility of a shift in bond buying policy--something longer-term bonds COULD actually get excited about. The relative excitement can be seen as rates began falling again in February. Now this week, we have confirmation from the January 30 meeting minutes that the Fed had an even more robust discussion about its balance sheet. By Friday, numerous Fed members were on the record talking about an end to balance sheet reduction in 2019--a far cry from Powell's "steady as she goes" attitude in early January. This brings us to the Fed's relationship with the housing market. Whenever the Fed flips the switch on its balance sheet reduction plan, it will cause an immediate influx of substantial demand in the bond market. And again, bond market demand = lower rates (specifically, lower longer-term rates, like mortgages). 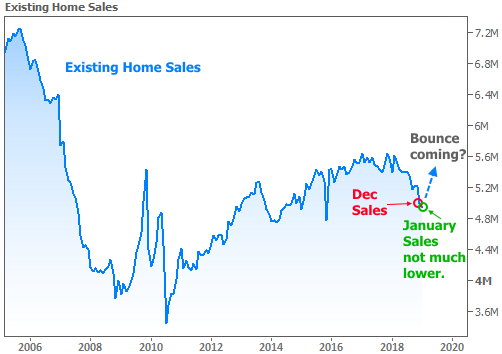 Connecting the dots, we've talked quite a bit in recent weeks about the role of mortgage rates in housing demand. True, it's not the primary driver of the housing market, but it's an important supporting actor that can tip the scales if other aspects of the market are on a fence. Lawrence Yun, the Chief Economist for the National Association of Realtors agrees. Although January's Existing Home Sales numbers didn't get a boost from December's rates, he said lower rates will "inevitably lead to more home sales." In fact, he sees January's numbers as a "cyclical low"--something I suggested would be the case in last week's newsletter! I'm telling you this because I want to be a cheerleader for the housing market. From an objective standpoint, there was a lot of uncertainty in the market at the end of 2018 due to stock losses and the government shutdown. It's no surprise to see it carry over to January, and it would be no surprise to see a bit of a housing recovery now that the shutdown is over, stocks have bounced, and the Fed is suddenly feeling friendly. The friendliness is not without risks though. Ultimately, the Fed's friendliness depends on the state of the economy. When Fed Chair Powell delivers congressional testimony on the state of the economy next week, he'll likely try to strike a balance between recent policy extremes by reiterating the Fed's dependence on the economic data. If markets perceive him as being too upbeat about the economy or if he pushes back on his colleagues thoughts on the Fed's balance sheet, it could put upward pressure on rates. Hello my name is Michael Ullmann and I am your mortgage expert My team and I serve all of Virginia, Maryland, DC, North Carolina and Georgia and we are happy to help you find the best possible financing options.